Anxiety Magnetic Bracelets: Can Wristbands Alleviate Anxiety? 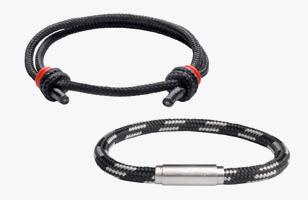 Magnetic Bracelets and Anxiety Relief: Do They Work? Nearly 20% of the American population suffers from anxiety. It’s one of the most common types of mental illness in the world and you likely know a few people in your own life who have anxiety – or you may suffer from it yourself. Sufferers of anxiety frequently resort to substance abuse to find relief. Unfortunately, this behavior often leads to a downward spiral that only worsens anxiety. Natural alternatives are a much better option than harmful substances. In the pursuit of anxiety relief, some individuals have begun to use magnetic bracelets for anxiety. Many of the people using these bracelets have reported significant relief from their symptoms. Currently, there have not been any scientific studies on using magnetic wristbands for anxiety. However, there are studies on the use of magnetism that show it may have a beneficial effect on circulation, inflammation, pain levels, and more. Researchers are not sure how magnets exhibit this effect. Further studies are needed before a conclusion can be made. Learn more about how magnets work.